I’ve never really paid that much attention to my hair before, at least in terms of curating a set hair routine. 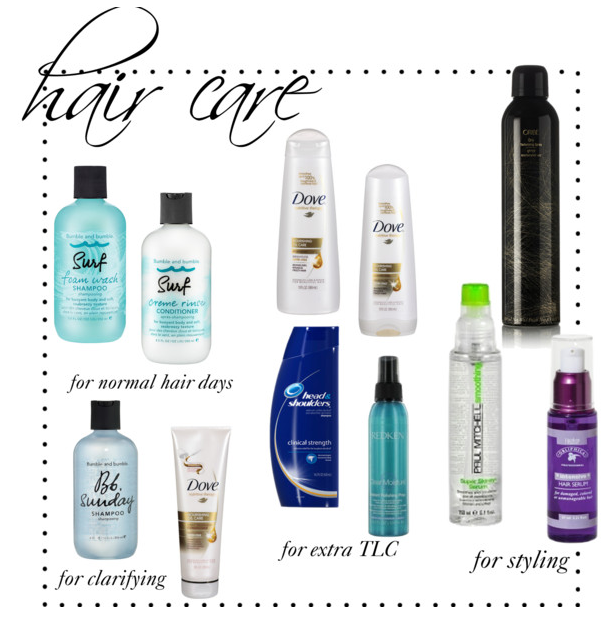 but over the past few months, I’ve slowly put together a little edit of products I’ve found to work well with my hair. for reference, my hair isn’t particularly high maintenance at all, which probably explains why I’ve always been a little ambivalent about it. it does have its own set of quirks, though. it’s stubbornly straight – it doesn’t hold a curl. on the odd days when it’s being weird, the last 2 inches get a little wave, but those days are few and far between and it usually only happens when I’ve slept on it weird or when the weather is unbearably hot. my hair is also very thick and tangles really easily. it is also quite oily – the longest I can go without washing my hair is every other day, unless I work out, in which case, it gets washed every day. I’ve found that for “normal” days, I prefer shampoos that give my hair a little “grit”, like the bumble & bumble surf set. I think it helps combat the oiliness and gives my hair a little texture so it isn’t quite so pin straight. I also like this shampoo for the fact that I took a little mini set with me when I went home to the Philippines and now, every time I smell it, I’m reminded of our time there. for the days my hair needs a little extra TLC, I like richer shampoos. I tend to stay away from shampoos that have oil since my hair’s oily as it is, but the dove nourishing oil line is amazing. it’s super moisturizing without weighing my hair down at all or making it more oily. I don’t quite understand how it does it, but I’m sold. I do occasionally get dandruff flare ups (gross, but we’re being real, right? ), so once every two weeks or so, I use the head & shoulders clinical strength shampoo to keep my scalp nice and healthy. the regular kind does nothing for me (although I love the green apple scent! ), and selsun blue is just way too intense in every way. I’ve found that this version is just right. it is drying, so I make sure to use the dove set the next day to give my hair extra moisture. for the last bit of TLC, I love the redken instant polishing prep. I had a stylist use it once on my hair while she was cutting it, and it was just a great multi-tasker – it does a little detangling, a little smoothing, gives a little bit of shine, etc. I spray it on when I’m having a lazy hair day right out of the shower when my hair’s still wet. it makes brushing my hair that little bit less painful and just sets my hair up for a low maintenance day. as for styling, I’m still loving the oribe dry texturizing spray and the paul mitchell super skinny serum. the former is great for second day hair to combat any oiliness and to give some no-fuss texture. the latter is great for the wonky days when my hair’s going every which way. a pump of this finger-combed through my hair gets things to lay a little more normally. the new addition to the styling menu is the obliphica intensive hair serum. I received a sample in my birchbox and it was instant love. for one, it smells divine. secondly, it’s like a little boost of repair to my hair. like the paul mitchell, it’s a serum and helps my hair calm down, but it does a little instant nourishment and repair, too, with sea berry as one of its ingredients. it’s quite thick coming out of the bottle, but it’s weightless in the hair when rubbed in. my hair has just looked better since I’ve been using this a couple times a week. when all is said and done, using all of these products regularly leaves some buildup behind. enter the clarifying shampoo. I use bumble and bumble‘s sunday shampoo. I love the name, I love the scent, and I love the way my hair feels afterwards when it’s light, insanely soft, and so easy. I pair it with the dove nourishing oil nutritive therapy daily treatment conditioner, which is the ultra moisturizing version of their already super moisturizing regular conditioner. this stuff is like butter.